Cheers to Beers! 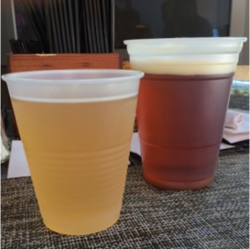 Breaking Down the Concept of Economic Impact with a Beer (or two) | Econsult Solutions, Inc. It feels like almost every month this year, a new brewery has opened in Philadelphia; add in the new distilleries and cideries and it’s close to true. Of the twenty breweries/brewpubs in Philadelphia, eight opened in 2017, with three others planning an opening later in the year. Philly beer drinkers have much to cheers about with many new breweries opening, nationally recognized brewers setting up shop in Philadelphia, the expansion of Dock Street, and the move (and expansion) of one of my personal favorites, Yards Brewing Co. These new and growing businesses are good for Philadelphia and personally, they are fun for me. I have my familiar favorites to return to, such as my oft-visited Manayunk Brewery – I lived ¼ mile away from it for ten years – and now, new places to visit, beers to try and food to taste. 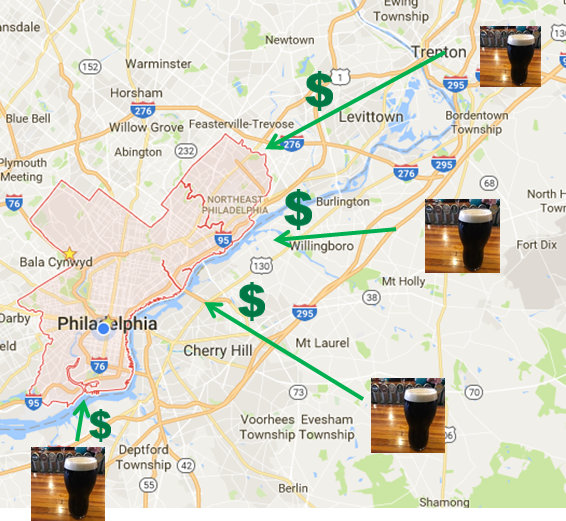 As you are reading this, sit back, grab a beer, and learn about your current, and soon to be new favorite local places’ economic impact in Philadelphia. One word of boozy caution. Philadelphians notoriously fight about what to call their neighborhoods. The city has no “official” boundaries, so we use the boundaries created by the University of Pennsylvania’s Cartographic Modeling Lab, which we use for our Philadelphia Housing Price Index (PHI). These areas are fairly large and may not include smaller neighborhoods that people identify with. I understand the important branding and marketing aspects of neighborhood designations, however, for the analytical and consistency purposes here–really how analytical can this be after a few beers–we use the neighborhoods from ESI’s PHI. In addition to providing new dining and drinking options, these breweries/brewpubs have a multifaceted impact on our local economy. These businesses create new jobs, attract spending in our regional economy, increase property values, and spread the Philadelphia brand. For instance, breweries spend money to brew beer, sell their beer to restaurants and retailers, and market their tasting room and restaurants. Some of their direct spending is on the wages they pay to their employees and contracts with local companies for goods and services. 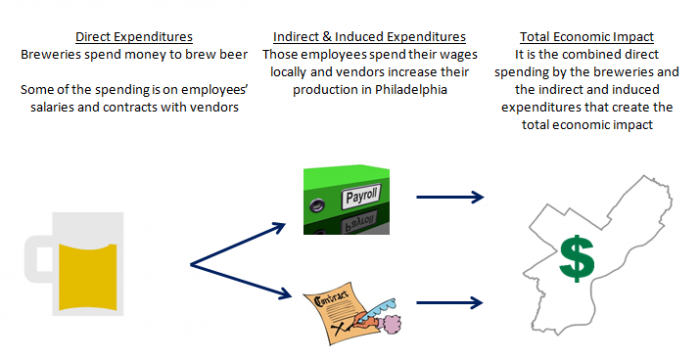 Those employees and local vendors then make some of their own purchases in Philadelphia creating a second wave of economic impact called the induced and indirect impacts. Combined, these create the total economic impact. However, for an economy to grow, it needs a constant infusion of spending from outside of its boundaries. The breweries are helping with this by attracting visitors from outside the region to their establishments and distributing their beer to restaurants, bars, and retailers in other cities and states. For instance, the sale of Yard’s beers at liquor stores in New Jersey, benefits Philadelphia. As New Jersey residents buy Yard’s from their local retailers, a portion of those sales comes back to Philadelphia. Yards can then use that money to pay for its regular operations, which includes paying their employees and vendors, leading to the second wave of economic impact. This infusion of money from outside of Philadelphia, if constant, allows for growth of the establishment and, at scale, the overall local economy. Another economic impact the breweries/brewpubs generate are property value impacts. There have been plenty of articles in the past few years, and we definitely see this in Philadelphia, of breweries renovating former industrial buildings. By renovating vacant buildings or building new facilities for their brewing process, tasting rooms, and restaurants, breweries are creating a positive impact on property values. The productive use of these restored buildings and the creation of new buildings is important because it has two impacts: first on itself, now these buildings have higher property values, and second, on the buildings around it, increasing their property values. Evil Genius Tasting Room , formerly a carriage factory; Wissahickon Brewing Company, formerly an ambulance storage facility. The initial financial investment required to obtain the amount of space needed to brew at scale, and to have a kitchen for those that do, is high, and because of this, breweries often will locate outside of a central business district. If we look at a map of the 20 Philadelphia breweries mentioned, only two are located in Center City, with two more planned. There is a concentration in revitalizing/gentrifying neighborhoods. A large enough business can establish the legitimacy of a place and be an early part of an area’s revitalization. Some may think of Dock Street, Yards and Philadelphia Brewing Company as being on the forefront of re-creating the demand to visit and locate in their neighborhoods. Other times, businesses wait until a certain population density and spending potential is established. Using ESI’s Philadelphia Housing Price Index (PHI), let’s look at neighborhoods where there are multiple breweries/brewpubs and where they lie along the recent timeline of their neighborhoods’ housing markets (which is a good indicator of demand for a specific geography). So, grab a Yard’s Washington Reserve Porter and let’s head to Fishtown. Using ESI’s PHI neighborhood boundaries, there are three breweries located in Fishtown (Yards being one) with a fourth planned (Goose Island – welcome to Philly, Chi-town). Urban Village and Fishtown Brewing both just opened in June and July respectively (these are two of the five I have not been to and need to visit). The revitalization of Fishtown is well documented. While we assume that Yards was on the forefront of this neighborhood’s revival, we see that in 2008, like other areas of the country, Fishtown was in a housing boom and valued higher than the city’s average. When the tasting room opened in 2010, we see the recession’s impact and the downward trend of the housing index. Fishtown has since recovered from the recession and its housing index is higher than its peak when Yards first located there. 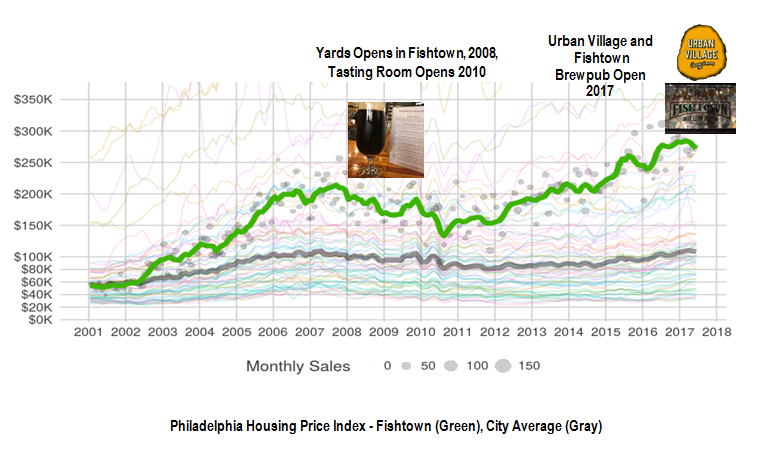 Urban Village and Fishtown Brewpub, both of which recently opened, are experiencing the neighborhood at its highest valuation since 2000. Our next destination is West Kensington. May I suggest the “So This is What it Feels Like When Doves Cry” from Evil Genius for our jaunt. As we can see, West Kensington’s PHI is much different from Fishtown. The neighborhood price index tracked consistently below the city average until about 2010, when in fits and starts, it has reached the city average. It is not until this year due to pricing and housing demand pressures from Fishtown and Northern Liberties that West Kensington’s housing price index could remain above the city average. St. Benjamin’s Brewing Company opened in 2014 with its tasting room following in 2016. Fermentery Form and Evil Genius both opened in the early part of 2017. Those in Philly real estate knew West Kensington would see an uptick, and these three breweries are on the earlier side of West Kensington’s revitalization. I need to stop by the neighborhood, I have only made it to Evil Genius. For the long haul, hop on Kelly Drive, then onto Forbidden Drive and try not to have too many of the Shake it Out Stouts from Chestnut Hill Brewing Co. once you get there. The Chestnut Hill housing price index is considerably different from the other two we have reviewed. Chestnut Hill has historically and continues to have a higher housing price index than the city average. In general, it tracks with the ups and downs of the city average, though in the beginning of 2017 we see an uptick at a faster rate than the city average, and it has reached its highest point since 2000. 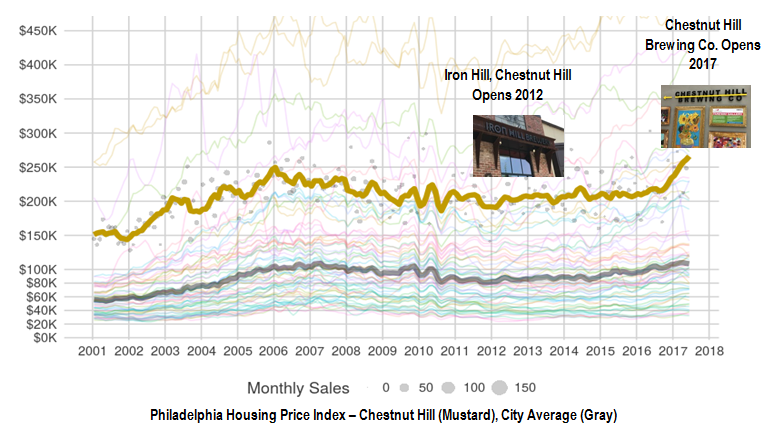 Iron Hill expanded to Chestnut Hill in 2012 when the housing price index entered a time of relative stability. Chestnut Hill Brewing Company opened in 2017 in Market at the Fareway. In the end, this blog may have been an excuse for me to check out the new breweries in Philly. I owe Carlos Bonilla, Research Analyst, and Nick Allam, Research Assistant, a few beers for their help on this. As for you, the reader, I hope you learned something along the way about economics and will check out some breweries in Philly. Until my next blog, you can find me entering new check-ins on Untappd. I use breweries and brewpubs interchangeably, with this many beers, it’s easier. 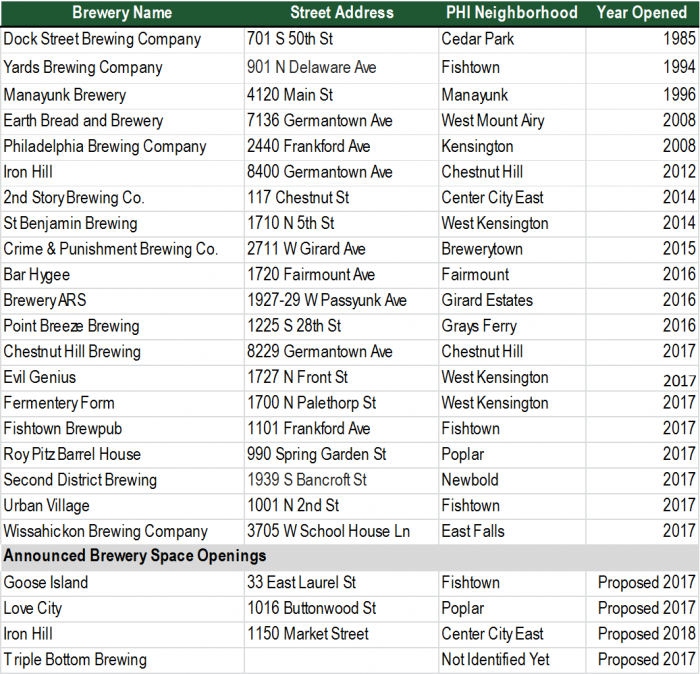 Flying Fish in Brewerytown is not included in this list as there is no brewing at the location and Flying Fish does not own the location. They provide the beer and use of the brands logo. In one week, I visited six new breweries and Flying Fish’s beer bar for my “research”. Therefore, please understand if there are some omissions or mistakes in my list, I had a lot of beer…no harm meant. The PHI neighborhood boundaries do not always line up with the neighborhoods in which a brewery says it is located. 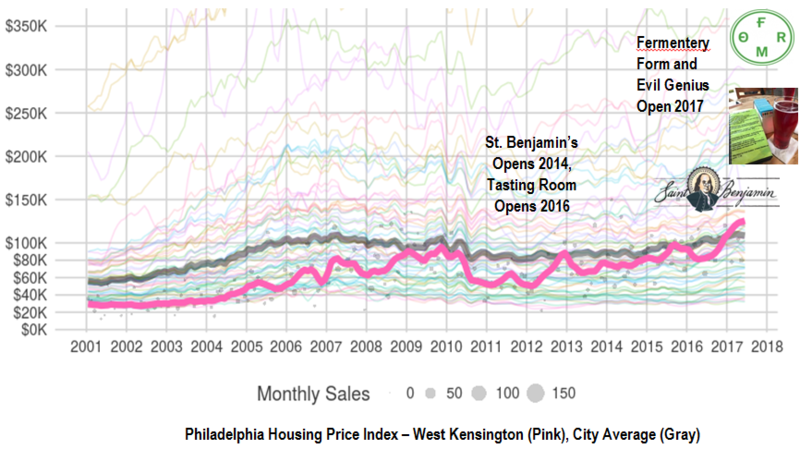 The addresses of the breweries are lined up with ESI’s Philadelphia Housing Price Index to compare with the housing index for those areas. This narrative is in reference only to Yard’s current location, not the 2002 location which is now the home of Philadelphia Brewing Company. 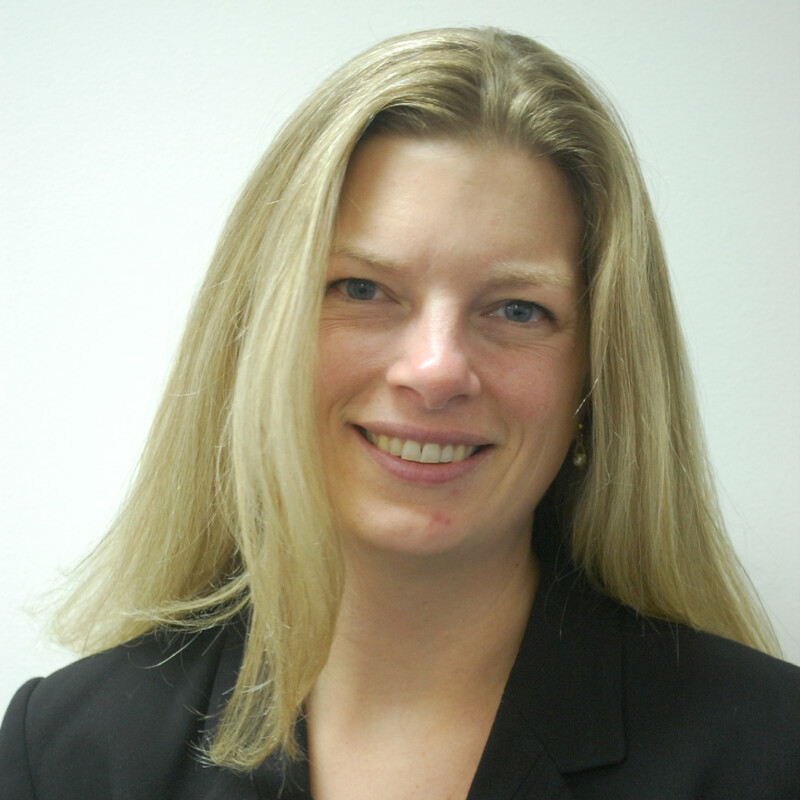 Andrea Mannino is a Director at ESI where she leads projects on local government reform and oversight. Prior to joining ESI, Ms. Mannino worked at the Department of Revenue, City of Philadelphia, as the Special Assistant to the Revenue Commissioner.